Colombia has been on my travel wish list for years. And while I agree with pushing against the glorification of Pablo Escobar, I can’t lie– this country jumped to the top of the Latin travel list partially thanks to the breathtakingly beautiful scenery highlighted in Narcos. Antioquia was my favorite character in that series. We arrived in Valle de Aburrá almost two weeks ago. The ride to our temporary home in Envigado from José María Córdova International Airport wound us through the green Andes and into the valley below. It was like meeting my favorite character from Narcos in real life. Lush tropical leaves waved from every direction, their value acknowledged by the countless nurseries dotting the mountainsides, and the greenhouses lining the main road. Our first hiking experience in Colombia took us right back up into those jungle mountainsides, and also brought us face to face with a bit of narco history. We found a path called the Arenales hike. Only a cheap cab ride away from Envigado, it featured waterfalls and it was estimated to take a couple of hours. Perfect for our first Saturday afternoon. Researching the trailhead, we discovered it begins at the former site of La Catedral - Pablo Escobar’s self-built prison complex. The history goes that, over years, the prison was slowly destroyed by looters looking for money. Eventually, they gave up, but rather than going empty-handed, they began taking pieces of the building to reuse in building structures in Envigado. A helipad, a guard tower, and a few ruined walls are what today remain of La Catedral. Monasterio Santa Gertrudis La Magna, a nursing home run by Benedictine monks, now calls this site home. The path along the lower edge of the monasterio leads into a mountain forest of tall pines. 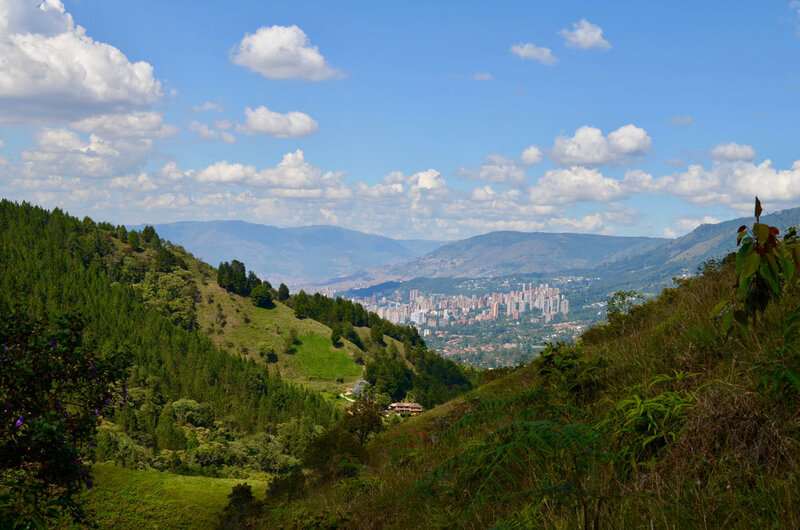 The route we chose would be a descent down to the town of Caldas, where we could catch a local bus back to Envigado and be home before the sun went down. Because of a late start to our hike (we started around 1:30pm), we didn’t tack on a side route to Salto del Angeles waterfall - though we heard from fellow caminantes that it was absolutely worth it. Leaving the pine forest, the descent began to get more serious, and we quickly dropped elevation into lush jungle. We scrambled. We used ropes to lower ourselves down steep inclines. We used our hands to do a bit of actual rock climbing down one particularly intimidating phase. Our efforts led us directly to Chorro de las Campañas, a crystal clear refreshing cascade of (very chilly) water. Post waterfall, we weaved our way down a length of the mountain stream. Sometimes marginally on a narrow dirt trail, sometimes directly through haphazard piles of slick rocks breaking up the flow of water. We chose barefoot– extra challenging, but it made every step more rewarding. There were some tricky points to pass. I always elected to stick with water routes, sliding down mini falls when necessary. Once, I was rewarded by being dumped into almost chest-deep water. Sean stuck to the marginal routes, using upper body strength to scramble and climb across rock faces that above the stream. The path ends with a narrow concrete ‘bridge’ that crosses the stream. The descent into Caldas continues along a well-maintained path that spills out onto winding mountain road.